By phil (cancer surviver) from Clinton Twp. Mi. Designed for individuals with increased calorie and protein needs and/or limited volume tolerance. Calorically Dense, High-Nitrogen, Complete Liquid Formula. This nutritionally complete tube feeding formula provides extra calories, protein to meet nutritional needs and fiber to help support digestive health and normal bowel function. This product is a medical food intended for the used under medical supervision. It is not intended to diagnose, treat, cure or prevent disease. Simple To Take. Nutritional. Good Value. This arrived in a timely manner and at a very good price! by Betsy from Walnut Creek, Ca. Simple To Take. Good Taste. Nutritional. Good Value. Produces Results. Goes Down Easy. 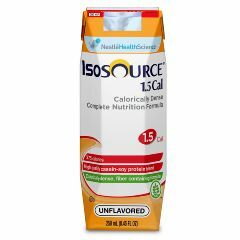 Isosource is calorie and nutrient dense and was recommended by the hospital nutritionist. Simple To Take. Good Taste. Produces Results. A lower carb count than Jevity while calorie and nutrition information are nearly identical. The price [...] is very reasonable. Answered on Nov 24, 2013 4:44:49 PM by Phil from Fort Myers, Fl. Is isosource 1.5 a generic for pivot 1.5 and have same ingredients identical. if it is possible found some help to buy becouse is very expensive for us to my 40 years old nice ? if i place and order today will it be here by Tuesday and whats the shipping cost? I'm a throat cancer survivor but having problems swallowing, causing me to lose weight. This product sounds as if it is what I'm looking for calorie wise. Can it be taken orally? It appears that it is to be taken through a feeding tube. I am able to eat some solid foods so I'm looking for a supplement. I now supplement with Boost, but it is not enough. I'm sill losing weight, This product looks like it will fill the bill in helping to stop my weight loss. I gained much needed weight while on this food! And, knowing that it has an incredible mix of necessary vitamins, minerals and proteins gives me peace of mind that I am getting my nutritional needs met. I would recommend this to anyone, but I have to tell you that I am tube fed, and don't drink this orally. I have heard it is a little "chalky" for those who do. For me, if I needed to gain weight and I wanted solid nutrition, I would drink it anyway! It's not that it is bad tasting, just thick with nutrients. It has been my literal life saver. I have bad reactions to other brands and am so grateful to have my doctor recommend something I could keep down. Although late in the game, I hope this was helpful, if not to you to someone else who might be wondering the same thing.